So, maybe you’ve just started poking your head around the AWBW site and you’re wondering why people keep complaining about this “FTA” thing. On the other hand, maybe you’ve been around a bit but you’ve never understood why it was really necessary to start Blue Moon with an infantry; you might just not believe that it’s important, or that FTA even exists at all. Whichever it is, I’m going to help shed some light on the situation and clear up some of the mystery and disbelief, starting at the most basic level and working my way up. A lot of you wrote: Hey! The original games didn’t bother addressing FTA! 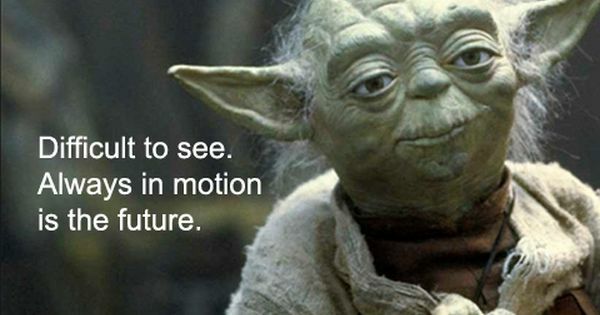 Some of you wrote: Who cares, that’s only one move! A few even wrote: You guys are just digging into this too far. I assure you that many talented players and map makers have thought this through and there’s a reason why it’s stuck around for so many years, despite the fact that the original games did not address it. The original games actually did very little to address player balance at all, but the context is different because the purpose/goals of AWBW and the original games are not the same and on AWBW you’re playing against real people, not the AI. The moral of the story is that, at least on AWBW, near-perfect balance is extremely important because it’s the key to having a fun game where all players have a fair shot at winning. Skeptics wrote: Yes, that’s nice and all, but show me the facts! How do I know this really has an impact on balance and gameplay? Even if it’s real, player skill level must be more important, so I can’t see how FTA would ever make the difference of winning and losing. Once OS has done that you can quickly see how, all other things being equal, the match is already decided and BM has lost. 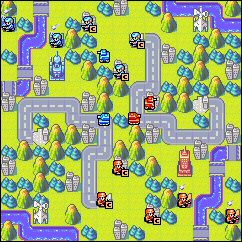 In either scenario, BM's options to attack or capture OS's HQ will both be unsuccessful. It doesn't matter how good the BM player is and how bad the OS player is- you can try all day, but OS will win with either of the obvious approaches I pictured. This, my friends, is FTA at its most basic level. 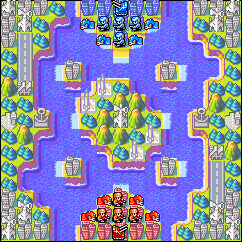 Map 2: Race to the Finish! I’m sure you can see that the objective is to capture the enemy HQ first and we’ll all agree that it’s easy to find your way there if there’s nobody guarding it. OS obviously buys the first infantry, gets the first infantry to the enemy HQ, and finishes capturing the enemy HQ first. Despite both sides being set up identically, there is no chance for BM to win unless OS throws the game. This is a very basic and contrived example, but the concept is important because there are a lot of sneaky ways that it can show up in design maps. 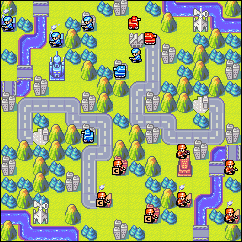 Looking at this map, you can see that, once again, OS gets first shot at the neutral base and, to make matters worse, there’s no safe place for BM to attack from. OS will certainly get the base and will have more funding and more places to build units. It might appear to be more fairly designed than the last example but the same principle applies- OS gets FTA and races to the important property first, leaving BM with little to no chance of ever achieving victory on this map. See how certain areas of the map require you to land via blackboat and only have one landing site? Since OS moves first, they can beat BM and block access to the central island and shortly thereafter, both East and West ports, preventing BM from ever accessing the key properties. Other, less extreme versions of this imbalance can be seen anywhere that the first player can cover a neutral property or blockade a chokepoint in a way that their opponent cannot reciprocate, especially if it's not easily countered. Now, you saw the effects of this in the last map a little bit, but pre-deployed units can be another map feature that results in serious FTA implications. 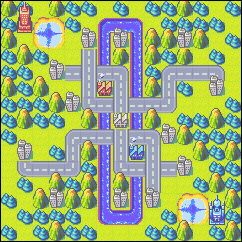 It sounds like a reasonably harmless thing to add, I know, but I’ll walk you through a couple turns on this next example map to show you what I mean. 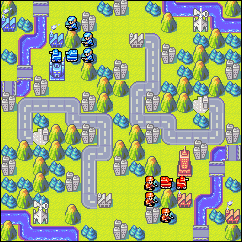 On Day 1, OS has the ability to send their two vehicles up towards BM to cause pressure, but they don’t have to place them in the line of fire to do so. This gives them an edge. On BM’s first chance to move, they have a couple options. 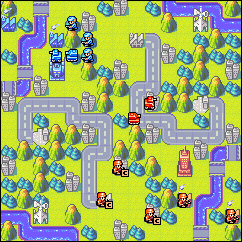 Option 1 is to play more defensively and try to protect their capturing infantry on the neutral base as best they can. See how on Day 2 this still leaves OS the ability to destroy BM’s capturing infantry. Although OS leaves themselves open to counterattack here, delaying capture of that base is much more important in the long run. They also finish capturing their own base before BM has a chance to interrupt, giving OS a huge advantage. Alternatively, BM could play a bit more aggressively, advancing their tank, but note that the outcome is the same. OS can still damage or destroy the capturing infantry and also has the option of hitting the enemy tank first. Just as before, OS captures their own base before BM can reach it. While OS has a lot to gain by being aggressive early on, doing the same or similar things in BM’s position will accomplish effectively nothing. 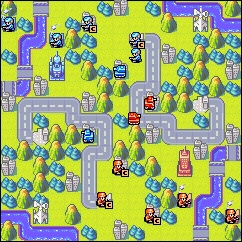 What this demonstrates is that, even with their best defensive strategy BM can’t capture the neutral base as early as OS and even with their best offensive move they can’t reach OS’s infantry before it finishes capturing. Once again we see that BM is at a significant disadvantage here for no reason except for the fact that they have to move second. You mean big maps don’t have FTA? I hate to break it to you, but that’s not how it works. You see, what I said was that it would solve the biggest problem with FTA on this map, but it will not solve all the FTA problems. Unfortunately, OS will still be one step ahead all game long, though generally, larger maps do tend to have more diluted FTA than similarly designed smaller maps. Alright, alright, I know you’re tired of examples and explanations, but does it all make a bit more sense now, at least? ... Good! Well, just keep in mind that I made these examples obvious to show you the concepts, but virtually any conventional map has some form of FTA, it might just be harder to spot in some cases than others. Keep your eyes peeled and before you know it you’ll be experts at spotting FTA! If you want to learn more, including how to effectively counter FTA, you’ll have to attend my next course in this series: FTA Guide II: Advanced Level Course. (Coming Attraction) Alternatively, for more information on Map Design you can attend my series of courses on that as well, starting with Map Making Guide I: Introduction to AWBW Map Design. As always, feel free to let me know if there’s anything you think I should have explained better or in more detail- these are all designed to help you guys, so your feedback is important! Also, any suggestions for new/unrelated topics you’d like to see covered are more than welcome! Alright everybody, now that I’ve accomplished my goals of FTA education, shameless self-promotion, and feedback encouragement, I’ll let you all go home to whatever it is you find so enjoyable about home. Class dismissed! Thanks for writing such a detailed explanation of FTA. Will STA be in the next FTA guide? The next guide isn't fully fleshed out yet, but it will primarily focus on FTA counter theory; basically what the generally accepted counters are and why/how they work. This will include what happens when you overcompensate and end up with STA. It's all still very much on the drawing board right now so it's hard to say how things will end up working out, but there may even be a third, more nuanced level when it's all said and done. Hmm, it looks like the hosting service removed my images or something. I'll have to re-upload them. Thanks!